Forrest Wilshire created Wilshire and Co in Tenterfield in 1960 it first operated as a Stock and Station agency. 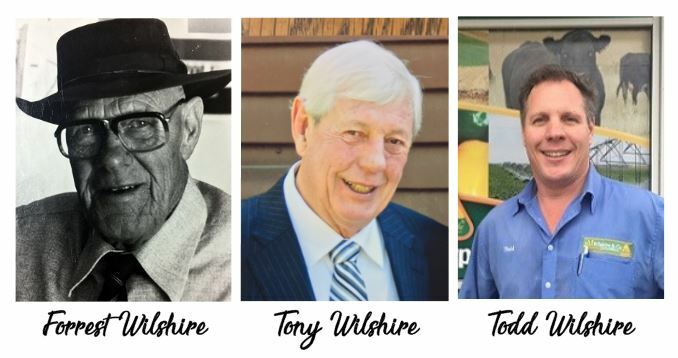 Forrest’s son Tony Wilshire, who was an experienced Dalgety’s stock and station and auctioneer moved back to Tenterfield and joined the business in 1979. In 1984 Wilshire and Co purchased Tenterfield produce to supplement the existing special agency core business. In order to expand and develop the rural merchandise side of the business in 1992 Wilshire and Co joined the CRT buying group. Tony’s son, Todd Wilshire joined the business in 2002. One year later Wilshire and Co expanded to Stanthorpe and later that same year Todd became Managing Director of the business. In 2008 the business continued to grow with the opening of the store in Deepwater NSW. In 2009 Wilshire and Co saw the need for diversification and the Stanthorpe store added a Thriftylink hardware store to the Stanthorpe rural premises and as a sign of its success has been awarded the Thriftylink Retail Store of the Year in Queensland (under 700sqm) for 2010, 2011 and 2012. In September 2012 Wilshire and Co acquired Texas and Mingoola Rural Traders, and later in 2014 Wilshire & Co Inglewood premises was opened offering comprehensive Rural Merchandise services, Agronomic Services and Thrifty Link Hardware all under one roof. Today, Wilshire and Co is a thriving, top quality rural merchandise business, which is moving with the times. The venture has grown from a business of 2 employees to now a dynamic enterprise with over 30 staff. Wilshire and Co is proud to have always been a family owned and operated business committed to its clients and local community for almost 60 years.